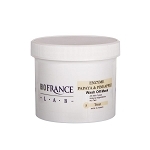 Enzyme Exfoliating Wash Off Mask, Bio France Lab, Papaya and pineapple Enzymes. Helps with dead skin cells and skin renewal. Papaya and pineapple are naturally rich in proteolytic enzymes; papain and bromelain. Both enzymes are known for their property to digest the bounding proteins of the dead cells located on the upper layers of the stratum corneum. They encourage skin renewal by exfoliating dead cells. -KAOLIN,DIATOMACEOUS EARTH ,BENTONITE,TITANIUM DIOXIDE, ANANAS SATIVUS (PINEAPPLE),CARICA PAPAYA FRUIT JUICE (hydrolyzed),CITRIC ACID.